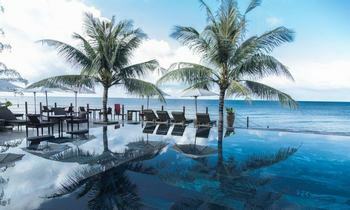 Besides beautiful beaches and luxurious resorts, Phu Quoc also attracts tourists by its impressive historical and holy sites. 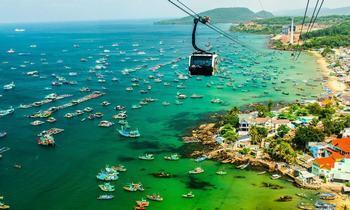 Hung Long Tu pagoda is a must-see destination when taking a Phu Quoc tour. Sitting at the top of a hill about four kilometers to the east of Duong Dong Town, Hung Long Tu pagoda is the most ancient Buddhist shrine in Phu Quoc. Also known with the name of Su Muon temple, it belongs to the sect of Pere Land Recluse under the management of Vietnam Buddhist Sangha Congregation. It was constructed by the monk Nguyen Kim Muon (1892-1946), who was initially an accountant in Dong Duong Bank and his religious name was Giai Minh. He made so much efforts to reform the way of Buddhism practicing in Vietnamese modern society. 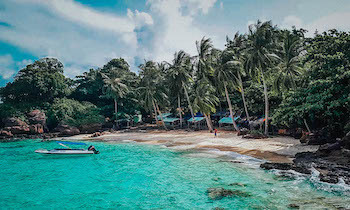 In 1932 while seeking for a tranquil place for a foundation of religious practicing, he moved to live on some island as Thom island, Tho Chu island and ultimately Phu Quoc where many settlers followed him to become Buddhists. At the first sight of Hung Long, visitors will be impressed by its peace, calmness, solemnity, and magnificence, Hung Long Pagoda is designed in the unique architectural style. The pagoda is situated halfway up a hill in the heart of a verdant forest with a superb scenery. Behind the pagoda are mountains with mighty ancient trees. The sanctum is built on the 3-meter thick stone base with the statue of Buddha is worshiped internally. To reach the sanctum, visitors must climb up more than 60 stone steps. The main altar houses several colorful relics as well as the golden statues of Buddha. Moreover, in the main hall, there is a large statue of Buddha while the front of it is a statue of Fat Buddha with children surrounding him. In the back is another Buddha's statue sitting under a large tree next to a high cliff. 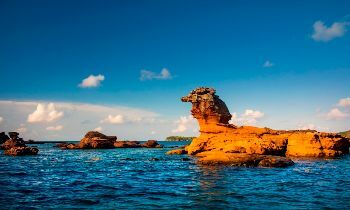 On the ground of Hung Long is a big rock having a shape of a kowtowing tiger with the colors and design created by human imagination. 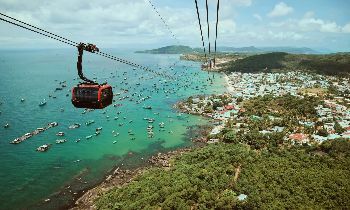 Looking down to the mountain slope from Hung Long pagoda's balcony, tourists will be greeted with a fabulous panorama of Ham Ninh mountain and coastline hemming Phu Quoc island right under their foot. While enjoying mountain breeze murmuring through sky-high trees with the tranquil atmosphere around, your soul seems to be entirely purified and fly up to the nirvana. What is special about Hung Long pagoda? Hung Long Pagoda hides itself in the thick forest, having nothing but serenity, and the incredible Buddha statues. 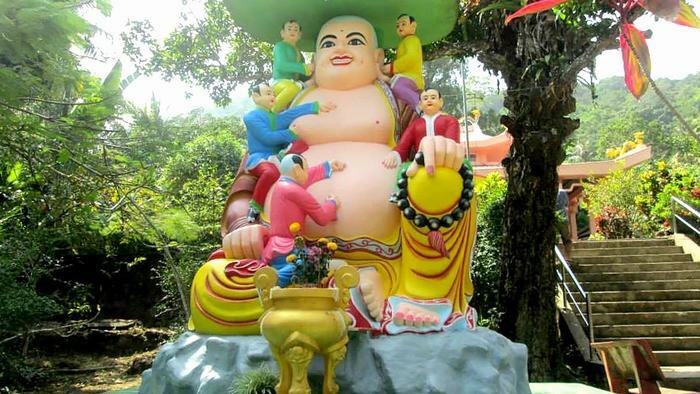 Among many figures of Buddha in the pagoda, the most attractive one may be the playful and colorful Buddha surrounded by children standing out. This statue stands in front of the pagoda while other beautiful statues can be found inside. Owning many statues of Buddha, painted rock formations in the shapes of various animals, plenty of greenish trees, especially a 300-year ancient Kenia tree, Hung Long Pagoda is a great place to see monks and devotees praying as well as expressing their respects to Buddha. 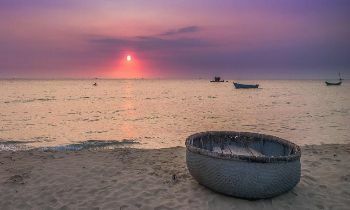 Visitors can get their fortunes predicted or simply enjoy the tranquility, calmness, and stillness during their visit. The entire temple is perched on a hill with the evergreen jungle surrounding. Visiting Hung Long on a hot day, visitors will feel very relaxed to enjoy the comfortable mountain winds. Especially, at the back of the temple has a lot of Myrtle. 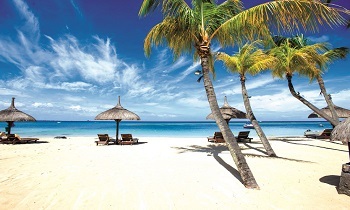 During the summer, the aromatic flowers will be in full bloom, creating a splendid scenery. 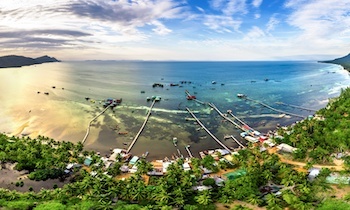 The path leading to Hung Long is around 4 kilometers to the southeast of Duong Dong Town on the way to Ham Ninh Fishing Village. You will pass the pepper farms and then pass a large gantry marking the end of town. Keep going 500 meters further and on the right-hand side of the road, you will see an ornamental gate surmounted by dragons and the lintel bearing the words HUNG LONG TU. Turn right on the single track road through the gate and it will lead you up the hill to the pagoda's parking area. ►As other religious sites in Vietnam, do dress respectably and avoid making noises as much as possible during your visit. If necessary, just whisper. 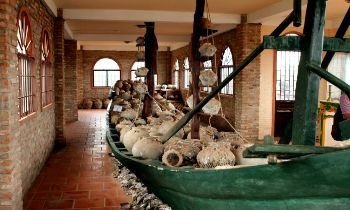 ►The entrance to Hung Long is free of charge, however, donations of any amount from visitors are highly appreciated. ►In front of the pagoda, there are some shops selling Vietnamese typical souvenirs and some kinds of cool water, which are worth spending. ►The road surface is fairly rough and it makes little difficult to reach if you are driving. 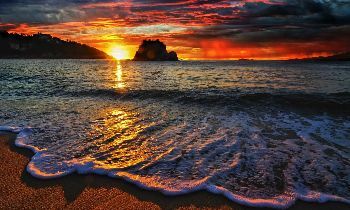 ►The best time to visit is in the early morning. 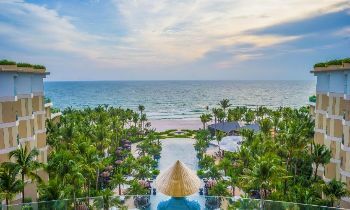 Regarded widely as one of the most beautiful islands in Vietnam, Phu Quoc is always on the bucket list of any travelers when coming to Vietnam. If you like to get away from the noisy tourist crowds and look for something calm, serene and peaceful, Hung Long pagoda is for you. 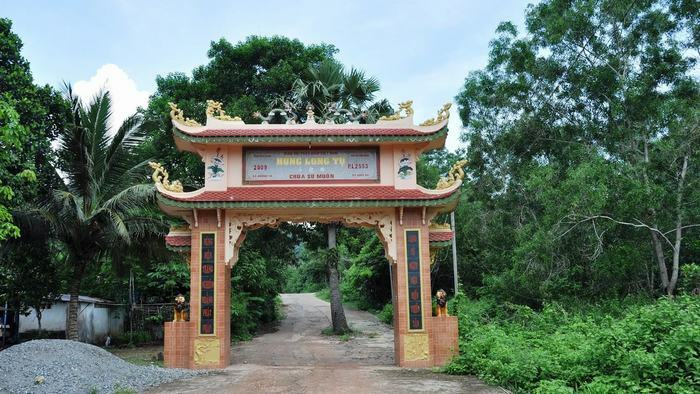 Visiting Hung Long pagoda, you will take a chance not only to forget all your everyday troubles but also have a glimpse at the religious life in Phu Quoc.